The Thirty-seventh United States Congress was a meeting of the legislative branch of the United States federal government, consisting of the United States Senate and the United States House of Representatives. It met in Washington, D.C. from March 4, 1861, to March 4, 1863, during the first two years of Abraham Lincoln's presidency. The apportionment of seats in the House of Representatives was based on the Seventh Census of the United States in 1850. Both chambers had a Republican majority. March 4, 1861: Republican pluralities are seated in Senate and House, becoming governing majorities in both Houses given vacancies among Southerners. Louisiana has 2 of 4 representatives remaining. Although represented in the Confederate Congress, Missouri and Kentucky remained with full delegations in the 37th Congress. March 4, 1861: Abraham Lincoln is inaugurated President of the United States. April 27, 1861: President Lincoln suspends habeas corpus from Washington, D.C., to Philadelphia and called up 75,000 militia. May 6, 1861: Arkansas Secession Convention enacted an Ordinance of Secession. May 20, 1861: North Carolina Secession Convention enacted an Ordinance of Secession. May 23, 1861: Virginia popular referendum ratified Ordinance of Secession. 5 of 12 U.S. Representatives remained. Two senators from the "Restored Government of Virginia" replaced the two who withdrew. June 8, 1861: Tennessee popular referendum ratified Ordinance of Secession. 3 of 10 U.S. Representatives remain. One Senator, Andrew Johnson, remained. July 21, 1861: First Battle of Bull Run Union approach to Richmond is repulsed. September 17, 1862: Battle of Antietam rebel invasion into Maryland is repulsed. November 1862: United States House of Representatives elections, 1862 and United States Senate elections, 1862 and 1863: Democrats gained 31 House seats to 31% and lost 5 Senate seats to 19%. The Senate, a continuing body, was called into special session by President Buchanan, meeting in March 4 to March 28, 1861. The border states and Texas were still represented. Shortly after the Senate session adjourned, Fort Sumter was attacked. The immediate results were to draw four additional states "into the confederacy with their more Southern sisters", and Lincoln called Congress into extraordinary session on July 4, 1861. The Senate confirmed calling forth troops and raising money to suppress rebellion as authorized in the Constitution. Both Houses then duly met July 4, 1861. Seven states which would send representatives held their state elections for Representative over the months of May to June 1861. Members taking their seats had been elected before the secession crisis, during the formation of the Confederate government, and after Fort Sumter. Once assembled with a quorum in the House, Congress approved Lincoln's war powers innovations as necessary to preserve the Union. 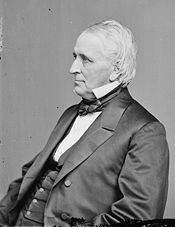 Following the July Federal defeat at First Manassas, the Crittenden Resolution asserted the reason for "the present deplorable civil war." It was meant as an address to the nation, especially to the Border States at a time of U.S. military reverses, when the war support in border state populations was virtually the only thing keeping them in the Union. Following resignations and expulsions occasioned by the outbreak of the Civil War, five states had some degree of dual representation in the U.S and the C.S. Congresses. Congress accredited Members elected running in these five as Unionist (19), Democratic (6), Constitutional Unionist (1) and Republican (1). All ten Kentucky and all seven Missouri representatives were accepted. The other three states seated four of thirteen representatives from Virginia, three of ten Tennesseans, and two of four from Louisiana. The Crittenden Resolution declared the civil war "… has been forced upon the country by the disunionists of the southern States…" and it would be carried out for the supremacy of the Constitution and the preservation of the Union, and, that accomplished, "the war ought to cease". Democrats seized on this document, especially its assurances of no conquest or overthrowing domestic institutions (emancipation of slaves). Congressional policy and military strategy were intertwined. In the first regular March session, Republicans superseded the Crittenden Resolution, removing the prohibition against emancipation of slaves. In South Carolina, Gen. David Hunter, issued a General Order in early May 1861 freeing all slaves in Florida, Georgia, and South Carolina. President Lincoln quickly rescinded the order, reserving this "supposed power" to his own discretion if it were indispensable to saving the Union. Later in the same month without directly disobeying Lincoln's prohibition against emancipation, General Benjamin Butler at Fort Monroe Virginia declared slaves escaped into his lines as "contraband of war", that is, forfeit to their rebel owners. On May 24, Congress followed General Butler's lead, and passed the First Confiscation Act in August, freeing slaves used for rebellion. In Missouri, John C. Frémont, the 1856 Republican nominee for President, exceeded his authority as a General, declaring that all slaves held by rebels within his military district would be freed. Republican majorities in Congress responded on opening day of the December Session. Sen. Lyman Trumbull introduced a bill for confiscation of rebel property and emancipation for their slaves. "Acrimonious debate on confiscation proved a major preoccupation" of Congress. On March 13, 1862, Congress directed the armies of the United States to stop enforcing the Fugitive Slave Act. The next month, the Congress abolished slavery in the District of Columbia with compensation for loyal citizens. An additional Confiscation Act in July declared free all slaves held by citizens in rebellion, but it had no practical effect without addressing where the act would take effect, or how ownership was to be proved. Lincoln's preliminary Emancipation Proclamation was issued September 22, 1862. It became the principal issue before the public in the mid-term elections that year for the 38th Congress. But Republican majorities in both houses held (see 'Congress as a campaign machine' below), and the Republicans actually increased their majority in the Senate. On January 1, 1863, the war measure by executive proclamation directed the army and the navy to treat all escaped slaves as free when entering Union lines from territory still in rebellion. The measure would take effect when the escaped slave entered Union lines and loyalty of the previous owner was irrelevant. Congress passed enabling legislation to carry out the Proclamation including "Freedman's Bureau" legislation. The practical effect was a massive internal evacuation of Confederate slave labor, and augmenting Union Army teamsters, railroad crews and infantry for the duration of the Civil War. Congress assumed watchdog responsibilities with this and other investigating committees. The principle conflict between the president and congress was found in the Joint Committee on the Conduct of the War. Eight thick volumes of testimony were filled with investigations of Union defeats and contractor scandals. They were highly charged with partisan opinions "vehemently expressed" by chair Benjamin Wade of Ohio, Representative George Washington Julian of Indiana, and Zachariah Chandler of Michigan. Sen. Chandler, who had been one of McClellan's advocates promoting his spectacular rise, particularly documented criticism of McClellan's Peninsular Campaign with its circuitous maneuvering, endless entrenchment and murderous camp diseases. It led to support for his dismissal. A congressional committee could ruin a reputation, without itself having any military expertise. It would create the modern Congressional era in which generals fought wars with Congress looking over their shoulders, "and with public opinion following closely behind." Republican majorities in both houses, apart from pro-union Democrats, and without vacant southern delegations, were able to enact their party platform. These included the Legal Tender Act, February 20, 1862, and increases in the tariff that amounted to protective tariffs. The Homestead Act, May 20, 1862, for government lands, and the Morrill Land Grant Act, July 2, 1862, for universities promoting practical arts in agriculture and mining, had no immediate war purpose. But they would have long range effects, as would the Pacific Railroad Act, July 1, 1862, for a transcontinental railroad. Treasury innovations were driven by Secretary Salmon P. Chase and necessity of war. The Income Tax of 1861, numerous taxes on consumer goods such as whiskey, and a national currency all began in Civil War Congresses. Speeches postage-free to District 1960, signature in upper right like 1863. Member's floor speeches were not meant to be persuasive, but for publication in partisan newspapers. The real audience was the constituents back home. Congressional caucuses organized and funded political campaigns, publishing pamphlet versions of speeches and circulating them by the thousands free of postage on the member's franking privilege. Party congressional committees stayed in Washington during national campaigns, keeping an open flow of subsidized literature pouring back into the home districts. Nevertheless, like other Congresses in the 1850s and 1860s, this Congress would see less than half of its membership reelected. The characteristic turmoil found in the "3rd Party Period, 1855-1896" stirred political party realignment in the North even in the midst of civil war. In this Congress, failure to gain nomination and loss at the general election together accounted for a Membership turnover of 25%. This first Civil War Congress was one of the last with a plurality of members drawn from the "Transcendental" generation born between 1792 and 1821. They accounted for 87% of the national leadership, with 12% from the upcoming Gilded Age, and only 1% from the older Compromise Generation. As an age cohort, they were idealistic and exalted "inner truth" on both sides of the Civil War, with neither side prepared to compromise its principles. Those few Compromisers left with a voice were pushed to the side. Representative Thaddeus Stevens was typical of his Transcendentalist generations northern expression: "Instruments of war are not selected on account of their harmlessness ... lay waste to the whole South." Congress did not accept secession. Most of the Representatives and Senators from states that attempted to secede left Congress; those who took part in the rebellion were expelled. Secessions declared during previous Congress: South Carolina, Mississippi, Florida, Alabama, Georgia, Louisiana, and Texas. Louisiana Congressional Districts LA 1 and 2, two of its four representatives remained seated in the 37th Congress. Although secessionist factions passed resolutions of secession in Missouri October 31, 1861, and in Kentucky November 20, 1861, their state delegations in the U.S. Congress remained in place, seven from Missouri and ten from Kentucky. Exile state governments resided with Confederate armies out-of-state, army-elected congressional representatives served as a solid pro-Jefferson Davis administration voting bloc in the Confederate Congress. Senators were elected by the state legislatures every two years, with one-third beginning new six-year terms with each Congress. Preceding the names in the list below are Senate class numbers, which indicate the cycle of their election. In this Congress, Class 1 meant their term ended with this Congress, facing re-election in 1862; Class 2 meant their term began in the last Congress, facing re-election in 1864; and Class 3 meant their term began in this Congress, facing re-election in 1866. Members of the House of Representatives are listed by their districts. Pennsylvania (1) Simon Cameron (R) Resigned March 4, 1861, to become Secretary of War. Ohio (3) Salmon P. Chase (R) Resigned March 7, 1861, to become Secretary of the Treasury. Virginia (2) Robert M. T. Hunter (D) Withdrew March 28, 1861, and later expelled for support of the rebellion. Virginia (1) James M. Mason (D) Expelled March 28, 1861, for supporting the rebellion. Illinois (2) Stephen A. Douglas (D) Died June 3, 1861. Illinois (2) Orville H. Browning (R) Interim appointee lost election to finish the term. Michigan (2) Kinsley S. Bingham (R) Died October 5, 1861. Oregon (2) Edward D. Baker (R) Killed at Battle of Ball's Bluff October 21, 1861. Kentucky (3) John C. Breckinridge (D) Expelled December 4, 1861, for supporting the rebellion. Missouri (1) Trusten Polk (D) Expelled January 10, 1862, for supporting the rebellion. Missouri (3) Waldo P. Johnson (D) Expelled January 10, 1862, for disloyalty to the government. Indiana (1) Jesse D. Bright (D) Expelled February 5, 1862, on charges of disloyalty. Rhode Island (1) James F. Simmons (R) Resigned August 15, 1862. New Jersey (1) John R. Thomson (D) Died September 12, 1862. Maryland (3) James Pearce (D) Died December 20, 1862. Members by committee assignments, Congressional Globe, as published July 8, 1861 Spellings conform to those found in the Congressional Biographical Dictionary. ^ a b Biographical Directory of the U.S. Congress (1774-2005) found online at Congress Profiles: 37th Congress (1861-1863) viewed October 24, 2016. ^ Martis, Kenneth C. "The historical atlas of the Congresses of the Confederate States of America: 1861-1865" 1994 ISBN 0-13-389115-1, p. 32. ^ Heidler, D.S. ; Heidler, J.T. ; Coles, D.J. (2000). Encyclopedia of the American Civil War: A Political, Social and Military History. p. 441. ISBN 0-393-04758-X. ^ "Ordinance of Secession of Arkansas". Csawardept.com. Archived from the original on September 27, 2011. Retrieved December 5, 2011. ^ a b c d Hart, Albert Bushnell; Channing, Edward, eds. (November 1893). Ordinances of Secession and Other Documents. 1860-1861. American History Leaflets Colonial and Constitutional. 12. New York: A. Lovell & Company. OCLC 7759360. Archived from the original on 2008-04-13. Retrieved 2017-11-15. ^ "Ordinance of Secession of North Carolina". Csawardept.com. Archived from the original on March 30, 2012. Retrieved December 5, 2011. ^ "Ordinance of Secession of Virginia". Csawardept.com. Archived from the original on December 4, 2011. Retrieved December 5, 2011. ^ a b c Martis, Kenneth C.; et al. (1989). The Historical Atlas of Political Parties in the United States Congress, 1789-1989. New York: Macmillan Publishing Company. ISBN 0-02-920170-5. ^ "Ordinance of Secession of Tennessee". Csawardept.com. Archived from the original on February 6, 2012. Retrieved December 5, 2011. ^ McPherson, James M. (2008). Tried by War: Abraham Lincoln as Commander in Chief. The Penguin Press. p. 23. ISBN 978-1-59420-191-2. ^ "Presidential Proclamation May 19, 1862", Abraham Lincoln's response to General Hunter's General Order Number Eleven. abolition was to be outside the police functions of field commanders. ^ New York Times: "How Slavery Really Ended in America" Viewed November 9, 2011. ^ Blaine, James G. "Memoir re-published on the National Archives webpage". ^ Erickson, Stephen C. (Winter 1995). "The Entrenching of Incumbency: Reelections in the U.S. House of Representatives, 1790-1994". The Cato Journal. Archived from the original on June 23, 2010. Retrieved November 4, 2010. ^ Swain, John W., et al., "A New Look at Turnover in the U.S. House of Representatives, 1789-1998", American Politics Research 2000, (28:435), p. 444, 452. ^ Strauss, William; Howe, Neil (1991). Generations: The History of America's Future, 1584-2069. New York: William Morrow and Company, Inc. p. 196. ISBN 0-688-08133-9. ^ a b c d Martis, Kenneth C., "The Historical Atlas of Political Parties in the United States Congress: 1789-1989" ISBN 0-02-920170-5. p. 114. ^ The Tennessee legislature ratified an agreement to enter a military league with the Confederate States on May 7, 1861. Tennessee voters approved the agreement on June 8, 1861. ^ Martis, Kenneth C., "The historical atlas of the Congresses of the Confederate States of America: 1861-1865", ISBN 0-13-389115-1, p.92-93. ^ a b c d e Biographical Directory of the U.S. Congress, (1774–2005), "Official Annotated Membership Roster by State with Vacancy and Special Election Information for the 37th Congress Archived June 10, 2011, at the Wayback Machine". ^ a b c Withdrawal" meant that these senators announced they were withdrawing from the Senate due to their states' decisions to secede from the Union. Their seats were later declared vacant by the Senate, but some seats were actually unfilled since the beginning of this Congress on March 4, 1861. ^ "Journal of the Senate of the United States of America, 1789-1873". p. 412. ^ "Congressional Globe". July 8, 1861. pp. 21–22. ^ "A Century of Lawmaking for a New Nation: U.S. Congressional Documents and Debates, 37th Congress, Browse by Committee". ^ a b The Bibliography of Vermont, Gilman, M.D.,The Free Press Association, 1897. p. 320. ^ Lanman, Charles (1887). Biographical annals of the civil government of the United States. New York: JM Morrison. p. 514. ^ "US Senate Art & History webpage, "Ashbury Dickens, Secretary of the Senate, 1836-1861"". ^ "Congressional Biographical Dictionary, 37th Congress" (PDF). p. 162, footnote fn 2. Archived from the original (PDF) on June 10, 2011. Retrieved June 29, 2010. Congressional Directory for the 37th Congress, 2nd Session. Congressional Directory for the 37th Congress, 2nd Session (Revision). Congressional Directory for the 37th Congress, 3rd Session.